Club Penguin Cheats by Mimo777 Club Penguin Cheats by Mimo777: Club Penguin New Early Newspaper! Well, Club Penguin wasn't joking when they said they were going to launch things early. The new Club Penguin Times is already here! The Puffle Party will begin tomorrow and end on Feb. 25th! Member penguins will want to be sure and go to the Puffle Show in the Ski Village. Non members will get to enjoy all the rest of the party! Don't forget to take your puffle with you to the party! Club Penguin has heard all the rumors of the "zany," "carrot-colored" puffle in the Ski Lodge and Box Dimension. They say to turn your penguin orange and search the island for the orange puffle. More details will be available in next weeks newspaper. yes! they said ski village about where people have seen the orange puffle though.. weird! I'm gonna be the first to find it! I think I like it coming at its regular time. It gives me something to look forward to every week, and since I've been on Club Penguin for 3 years, I guess I'm just not used to change. I was going to tell you but I figured you already new about it! O well. I'll try to find something else to tell you about! Does the puffle party come out tonight at 12? Its awesome alright. I saw the bunny lookin' orange puffle at the box demention. He floats down on a box in the sky and then he fly away. hes there for about 2-3 seconds. Aww I said that there was a newspaper too! Oh well, great job, goo goo7! i think its really cool that there going to be doing things early!!! i cnat wait for the party tomorrow~!! Yeah, me too.. I have been on for 3 years, and I am not used to change.. I like the early stuff... Toysgoneby does not hat patience! Good Observation! Maybe Mimo will give you credit! You are right! Good Observation! Yep! You are right! I am really hyped up about this party! If you need something to do.. take a piece of cheese, and see how many times you can fold it without it breaking... then smell the cheese, and look at it. Once you are done, send it to the Swiss Cheese Department of Canada, buy a koala, name it Juanita, and teach her how to waltz! You will never be bored again! Yeah, he is a quick little fellow! It took me 3 tries before I could get a picture of him/her! Like many mods say Mimo and other peeps are quick! I told him but goo goo 7 already told him! wow. This past year has been a HUGE change on Clubpenguin. From it going to barely any member only things, to ton of members only things, and merchandise and a ton of new things all the time on clubpenguin. Alot of change. Yep, How cool!? He also has a purple tounge :p how silly!? How cool is that!? very cool right? If you dress up as a ghost with a lantern you can also do something very cool. thats my favorite hidden costume dance. The Thing I have to say is that hopefully clubpenguin will have a set time when these things are released, and they are not just released at random times. that may not benefit the clubpenguin bloggers like Mimo. i cant wait to get da orange puffle toy! Mimo, you may have already posted this before, but I saw today, that the Puffle Party banner where it is colourful, it has all the colours f puffles and orange! Check it out! Put your mouse over the flying box on page A5. cool! I've seen thye orange puffle 5 times more or less. Sweet! Puffle Party! Mimo! Go to A4 and A5 pages and first look closely on A4. See the puffle? And then click on the box on A5.. See the puffle again? Mimo! the series 7 are in uk toys are us! Im getting them for mi b day wht is soon! I cant wait! look on the picture. behind the penguin on the ski machine thing there is a puffle! I Know Its Great Isn't It!? I wounder if that has anything to do with the orange Puffle??? Weird Indeed! 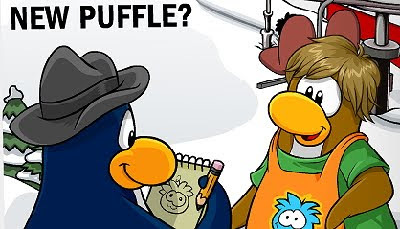 Me personaly I think That The Puffle Party Might Have A surprise Puffle Instore! Good Luck With That! You Never Know You Could Be CP's Inspector! Fred, Unless its automatic The party will have to be started by the clubpenguin 'crew'. Awesome Indeed! I saw It Yesterday And I sure Hope I Can Buy It! hey mimo if u put your mouse on the box in the newspaper it will open! what ever happen to billybob changeing were the langege bar is? Good Observation, but Mimo already posted this.. I like the whole stone trick! Well, I am going to be the second! ;) Can't wait! Yeah, if they come out at like 1:27 in the morning, I will have to go on the laptop I don't have to post the cheats! Yeah, that happens to me too.. someone beats me to it! That second that you go to take a bite out of a chicken wing is the second someone beats you to it! Me neither, I really want to see the orange puffle room, it will probably be the box dimension next year.. I cannot wait a year! I sort of agree. The orange puffle should come out earlier and be available in the pet store by the end of febuary, NOT the begining of march (Febuary is puffle month on clubpenguin, March is not.) BUT I do not think the orange puffle should have a room at the party. Afterall, that would make next years party boring, and not have anything particularly new. Back when ninjas were first discovered, we found out this shadow (along with the shadow in the lighthouse, a shadow on the ski hill, a shadow on the screens at The mission headquarters, on top of the shops in the plaza, in the dojo, and finally in the gift shop. I think that's all of them) Were Ninjas. :) For more information Mimo has some posts from october and november 2008 about how ninjas were discovered. Check them out! Well, now we know why they re-released the portal box!